Nowadays, iPhone provides multiple ways for the users to get music on their iPhone. Besides syncing music with iTunes Music Library, iPhone users can also use iTunes Match, Apple Music and so on to find the songs they like. After syncing music with iTunes, iPhone users may get duplicate songs in the Music app. At this moment, people will want to know how to delete duplicate songs on iPhone, but how to do that? As a matter of fact, iPhone users have several ways to remove duplicate songs from iPhone. The following post will show you three best ways to delete duplicate songs on iPhone. If you want to delete duplicate songs on iPhone, you can delete the duplicate songs in iTunes Music Library at first, and then sync them to iPhone again so that you can get rid of the duplicate songs. When using iTunes to delete duplicate songs, you can use the search function of iTunes to find the duplicate songs and delete them. 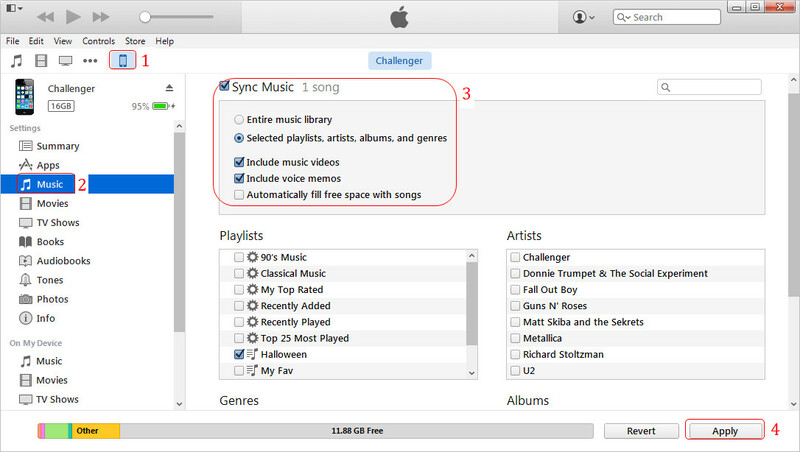 After cleaning the duplicate songs in iTunes Music Library, you can sync your iPhone with iTunes. Syncing iPhone with iTunes is easy to be done, and most of the iPhone users are familiar with it. 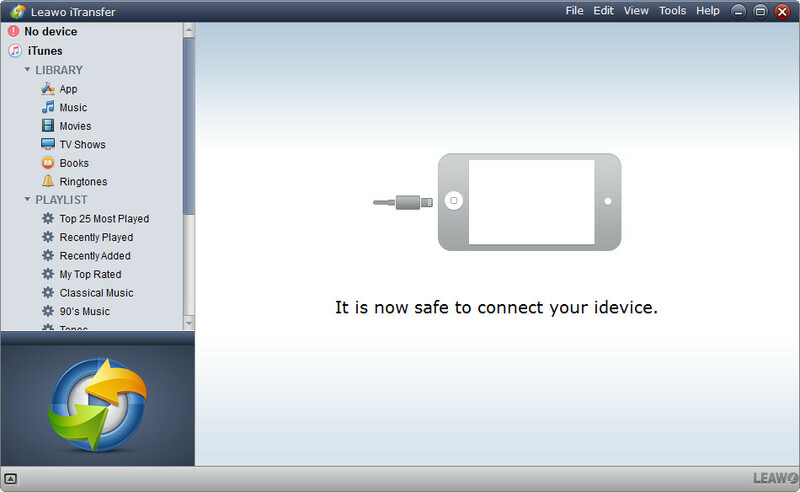 But many iPhone users are annoyed by the auto sync of iTunes, because the sync of iTunes may lead to data loss in iPhone. At this moment, people can use the iPhone transfer software to delete duplicate songs on iPhone without using iTunes. 1. Plug iPhone in and Click the iPhone icon after iTunes recognized it. 2. Click Music in the left sidebar. 3. Check Sync Music, and select songs you want to sync. 4. Click Apply at the right bottom. When you are going to remove duplicate songs from iPhone, you can check out Leawo iTransfer. This software enables you to delete duplicate songs on iPhone without using iTunes so that you won’t mess up with your iPhone. This iPhone transfer software is used for transferring files among iOS devices, iTunes and computers, and it also allows users to manage their iPhone data, including music, movies, books, etc. The following guidance will show you how to delete duplicate songs on iPhone separately, and you can free download the software to have a try. Step 2. Click the name of iPhone and choose Music in the left sidebar. The songs in your iPhone will display in the right part. Step 3. Use the search function of Leawo iTransfer at the upper right corner to locate the duplicate songs. Then select them and click the Delete button at the top middle. Step 4. 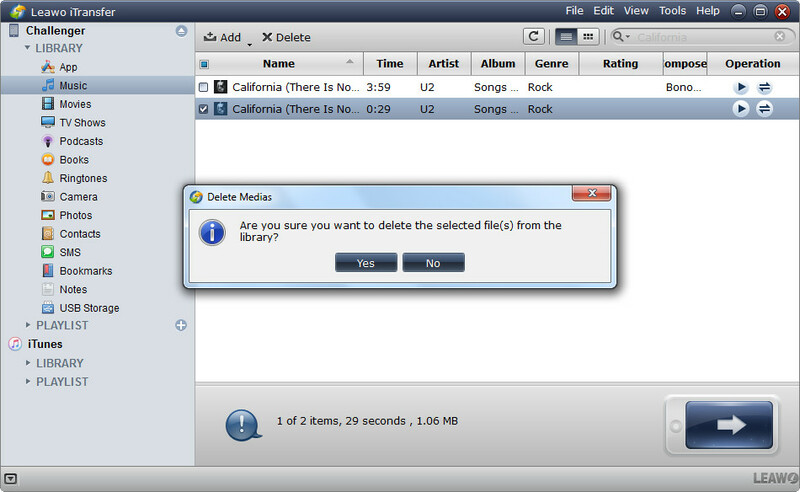 Click Yes in the pop-up dialog to start deleting duplicate songs on iPhone. When the deletion is finished, you won’t see the duplicate songs in your iPhone Music app anymore. This iPhone transfer doesn’t only help you delete duplicate songs on iPhone, but also helps to transfer other kinds of files, for example, you can transfer customized ringtones to iPhone as your iPhone ringtones. Leawo iTransfer will bring much convenience to your daily life, and if you are interested in it, just check it out. 1. Download, install and open Leawo Tunes Cleaner. Choose the "Clean-up Duplicates" option on the main interface. 2. 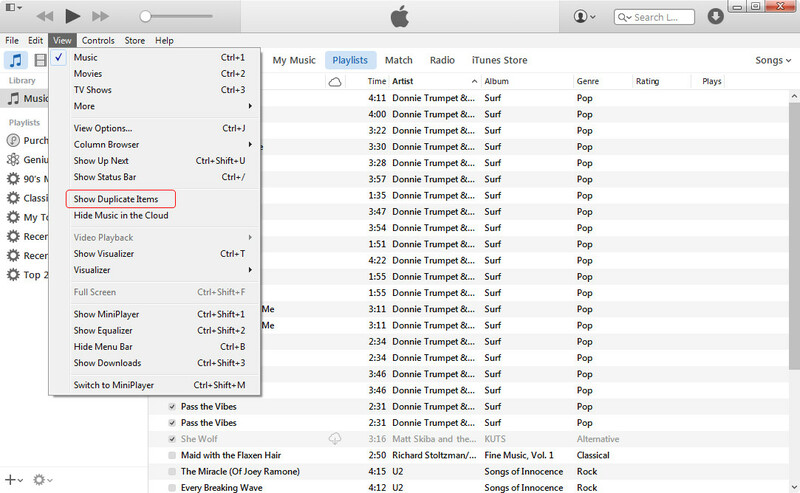 Select a duplicate scanning mode to detect duplicate songs in your iTunes from Quick Scan and Deep Scan. Quick Scan mode is based on song tags including name, artist, album, file size and time, while the Deep Scan mode adopts Accoustic Fingerprint tech for deeper scanning. Choose desired one. 3. Click "Scan iTunes" button to start scaning duplicate copies in your iTunes music library. 4. 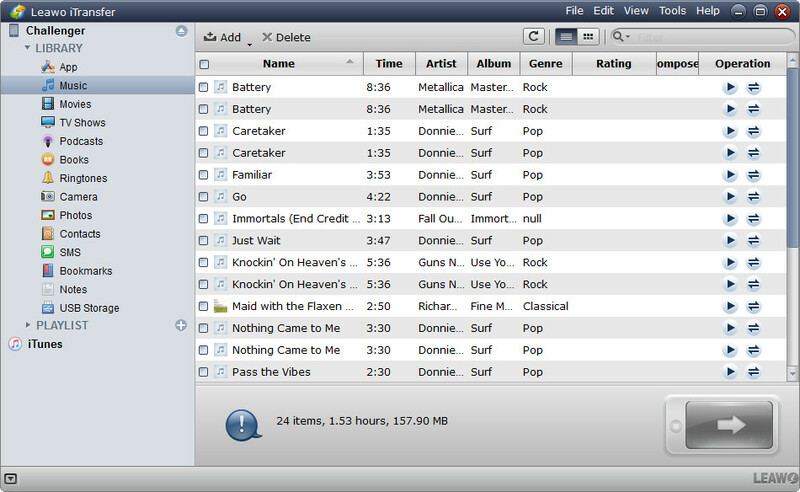 Via scanning, all duplicate songs would be displayed. You could play back all reference duplicates and determine which file to keep and which file(s) to delete. After selecting which files to remove, click "Remove" button. Tunes Cleaner would immediately delete all duplicate songs. 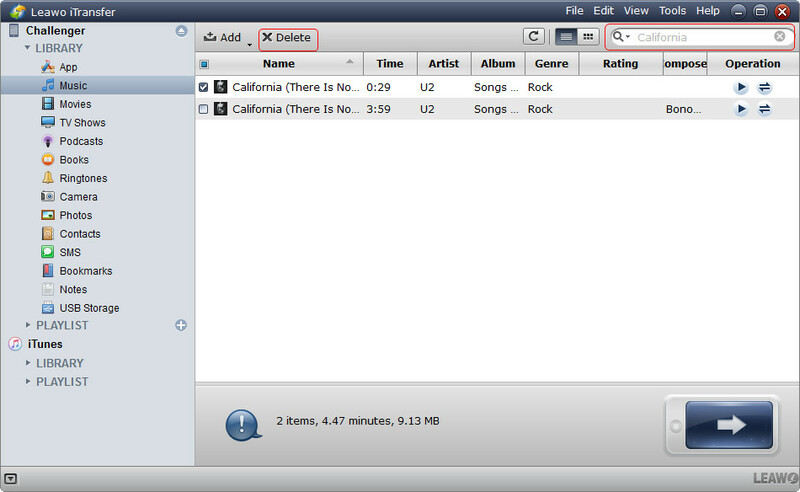 After you have removed all duplicate songs from your iTunes, sync your iTunes library to iPhone via USB. Connect your iPhone to PC and then sync the cleaned iTunes music lirary to your iPhone by following the method 1. Then, your iPhone music library would be refreshed and all duplicate songs would be deleted. The three methods mentioned above will help you delete duplicate songs on iPhone with ease, and each of the method has its advantages, so when you want to make the songs in your iPhone Music app organized, you can choose the method that fits you better.